Perfume is a liquid that gives people, things and rooms a good smell. It is made of oils which give off scent to the surrounding air. The odoriferous compounds that make up a perfume can be manufactured synthetically or extracted from plant or animal sources. Perfumes were used in the earliest human civilizations. Modern perfumery began in the late 19th century with the commercial synthesis of aroma compounds such as vanillin or coumarin. The artificial compounds gave a wider ranger of scents than natural materials. Perfume smells more when temperature is warmer. So people put it on the neck, wrist and back of the knee, because these parts are warmer. Eau de Cologne is a type of perfume which can be splashed on the body. It is not so concentrated as the usual perfumes. Today, most common essential oils, such as lavender, peppermint, and eucalyptus, are distilled. Raw plant material, the flowers, leaves, wood, bark, roots, seeds, or peel, is put into a distillation apparatus over water. As the water is heated, the steam passes through the plant material collecting the scents. The steam flow through a coil, where it is condensing back to liquid, which is then collected. Most citrus peel oils are cold pressed, like olive oil production. Citrus-fruit oils are cheaper than most other essential oils. Lemon or sweet orange oils got as by-products of the citrus industry are even cheaper. 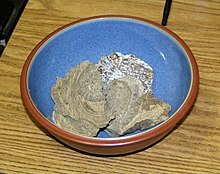 Ambergris: lumps of fatty compounds, secreted and expelled by the sperm whale. Because the harvesting of ambergris causes no harm to the whales, collecting it is not controversial. Castoreum: from the scent glands of the North American beaver. Civet musk: from the odorous sacs of civets, which are animals in the family Viverridae, related to the mongoose. Honeycomb: from the honeycomb of the honeybee. Deer musk: from the musk sacs from the Asian musk deer. Lichen. Commonly used lichens include oakmoss and treemoss thalli. Seaweed. Distillates are sometimes used as essential oil in perfumes. An example of a commonly used seaweed is Fucus vesiculosus, the bladder wrack. Natural seaweed fragrances are rarely used due to their higher cost and lower potency than synthetics. Many modern perfumes contain synthesized odorants. Synthetics can provide fragrances which are not found in nature. For instance, Calone, a compound of synthetic origin, gives a fresh metallic marine scent that is widely used. Synthetic aromatics are often used as an alternate to compounds that are not easily got from natural sources. The word perfume used today derives from the Latin per fumum, meaning "through smoke." Perfumery, or the art of making perfumes, began in ancient Mesopotamia and Egypt and was further refined by the Romans and Persians. The world's first recorded chemist is considered to be a woman named Tapputi, a perfume maker who was mentioned in a cuneiform tablet from the 2nd millennium BC in Mesopotamia. She distilled flowers, oil, and calamus with other aromatics then filtered and put them back in the still several times. In 2005, archaeologists uncovered what are believed to be the world's oldest perfumes in Pyrgos, Cyprus. The perfumes date back more than 4,000 years. The perfumes were discovered in an ancient perfumery. At least 60 stills, mixing bowls, funnels and perfume bottles were found in the 43,000-square-foot (4,000 m2) factory. In ancient times people used herbs and spices, like almond, coriander, myrtle, conifer resin, bergamot, as well as flowers. The Arabian alchemist, Al-Kindi (Alkindus), wrote in the 9th century a book on perfumes which contained more than a hundred recipes for fragrant oils and medical substances. The Persian chemist Avicenna introduced the process of extracting oils from flowers by means of distillation, the procedure most commonly used today. He first experimented with the rose. Until his discovery, liquid perfumes were mixtures of oil and crushed herbs or petals, which made a strong scent. Rose water was more delicate, and immediately became popular. The art of perfumery was known in western Europe since the 13th or 14th centuries. By the 18th century, aromatic plants were grown in France, Sicily, and Italy. ↑ Zibetto, civet, civette, profumi animali, aromaterapia, feromoni, pheromons, animal, scents, perfumes, parfums animaux. ↑ Strathern, Paul (2000). Mendeleyev's dream – the quest for the elements. New York: Berkley Books. ISBN 0-425-18467-6. ↑ Levey, Martin (1973). Early Arabic pharmacology: an introduction based on ancient and medieval sources. Brill Archive. p. 9. ISBN 90-04-03796-9. ↑ al-Hassani, Woodcok and Saoud 2006. 1001 Invention: Muslim heritage in our world. FSTC p22. This page was last changed on 29 September 2016, at 14:17.